Storm Malone took his first steps on campus… or maybe “rolls” is the better word. 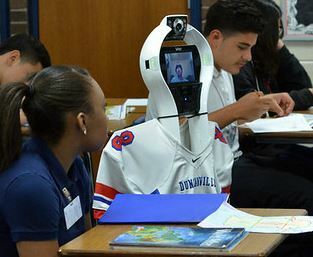 From his home, the freshman maneuvered a VGo robot, equipped with a screen and outfitted in his football jersey, through the campus and attended his world geography class. This was Malone’s first glimpse inside of the classroom since before his domestic violence incident this summer. Over the summer, Malone and his family were shot in a domestic violence incident. His mother and sister died, and he was left in critical condition. Since then, he continues to recover. Lori Aden, a representative from Region 10 educational service center, heard about the VGo program being used in another region and began the pilot program in this area. The robot allows home-bound students like Malone to actively participate in school. 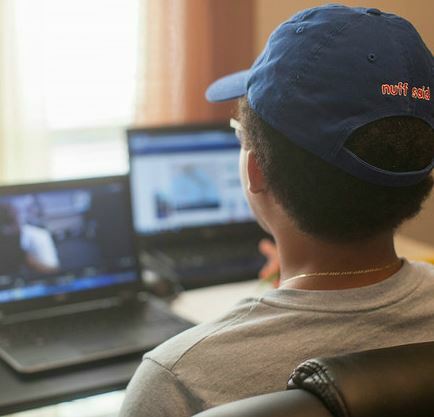 Malone is the second student to benefit from the technology, but with approximately 350 other home-bound students in this region, Aden hopes to expand the program with the help of corporate sponsors over the summer. Aden is passionate about the program because of the benefit it has on every student who witnesses it, not just the student operating it. "It already felt good just to see him at home doing better,” said classmate Kamaria Davis. “So to see him at school is still a big step, and it's amazing." Malone’s home-bound teacher Ruthie Achilles has been on this journey with Storm since the fall. She’s seen much improvement in his vision and writing and his ability to sit or walk by himself since then. “It’s wonderful just to see the small things every day,” Achilles said. Achilles believes the robot will give Storm a realistic view of what he misses by not being in class. Achilles said in addition to the academic advantages, he will benefit from interaction with his peers. Excerpts from Panther Prints Online and NBCDFW.